Baisakhi is around the corner and it's a very important festival for the Sikh community. It's to honour the birth anniversary of the tenth Sikh Guru, Guru Gobind Singh and it also marks the foundation of the Khalsa (the Sikh brotherhood) that took place in 1699. One of the most prominent festivals in the Sikh culture, Baisakhi is usually coupled with a celebration of new spring year and the end of the harvest of Rabi crop in India. And the occasion also demands a special ethnic wardrobe. Baisakhi 2019: Chef Vikas Khanna To Celebrate Vaisakhi With 'Patiala Babes' Paridhi Sharma and Ashnoor Kaur. No, it's not a rule that girls and ladies are required to dress up in a particular manner to ring in this occasion. But being a bit traditional on such days means no harm, right? You can always pick the most elegant looking attire from your wardrobe and style it in your personal way. From a traditional salwar kameez to an indo-western fusion outfit, the choices may wary and there's always an ample of scope to pick varied silhouettes. We have personally curated a list of attires that should benefit you this festive season. 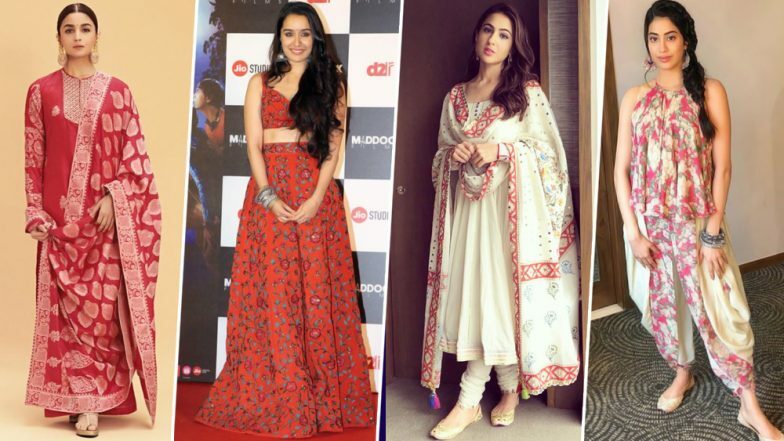 From Sara Ali Khan to Janhvi Kapoor, these girls are here to help you solve the styling mysteries and you can thank us later. So go ahead and have a quick look at them right below. Baisakhi 2019 Date, History And Significance: How The Harvest Festival Vaisakhi And Sikh New Year Is Celebrated In Punjab. How about a matching separates that are modern yet traditional in looking? Dhoti style pants paired with a matching halter neck top! Pick a plain crop top with matching pants and paired it with a chic printed jacket! It's necessary that you don't overdo your #OOTD. If your attire is too heavy, ditch all the jewellery and if it's too basic then pair it with statement earrings or a delicate but stunning necklace. The choice, in the end, is yours. Keep slayin' the way you always do.